PAD stands for Portable Application Description. This file format is used by application software developers to distribute information about their product. Developer makes PAD file of each software application and sends it to various websites for easy extraction and publication. 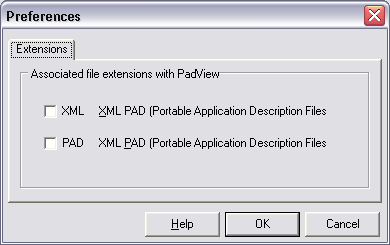 PADview is a portable viewer tool to open and view contents of XML PAD files. 1. 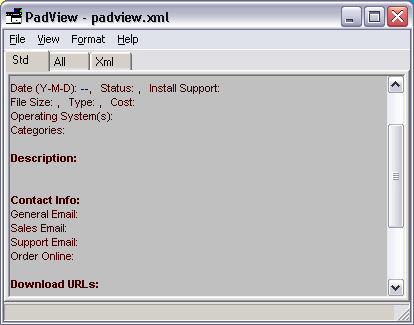 Download PADview program & unzip it. 2. Open the folder & double click icon to launch program. 3. Goto File > Open and select any XML PAD file for viewing. You can goto File > Preferences to configure file extension configuration for this program. Being portable you can carry this tool in USB pen drive for quick and easy viewing of PAD files.